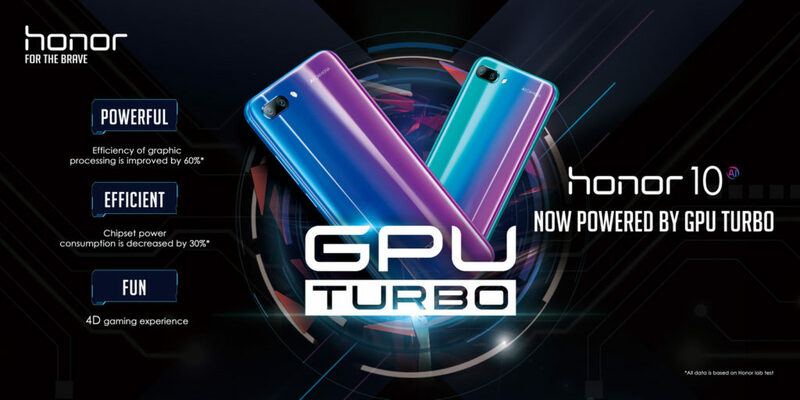 Honor will deliver two major upgrades to the Honor 10 starting from August 3, with the rollout of the revolutionary GPU Turbo, a groundbreaking hardware-software integration and graphics processing technology, coupled with an Automatic Image Stabilization (AIS) enhancement to minimize blurring and stabilize photo and video capture. The GPU Turbo guarantees fast performance speeds and addresses the common performance issues that plague the mobile gamer’s user experience. This innovative hardware-software integration solution dramatically increases the graphics processing power, and boosts the average frame rate to the fullest possible rate. Alongside the GPU Turbo update, the Honor 10 will receive an AIS software upgrade, an image enhancement that minimizes blurring and compensates for device shake while capturing photos and video. Within 0.2 seconds, the software detects if the device is handheld with 98% accuracy and automatically sets the exposure and framing using AI scene recognition. Against these major upgrades to the Honor 10, Honor plans to begin an exclusive testing program for Honor fans via the “Honor C.E.O.” initiative. This beta testing program will only be available to Honor’s core group of fans and highly engaging online influencers with strong social networks. Honor will recruit technically-minded users who specialize in four areas: unboxing, gaming, ID design and AI photography, and those who are happy to share their own experiences with Honor technology. I'm the editorial writer for DroidHorizon. You'll find my content varies in the technology, science, & lifestyle categories.